Petre Bandur was born in Boian, Bucovina in 1872. 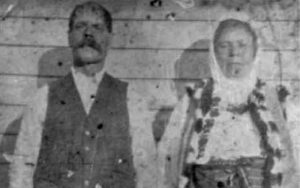 In 1897 he married Sanfira Sandulak, daughter of Simeon and Vasilca Sandulak. 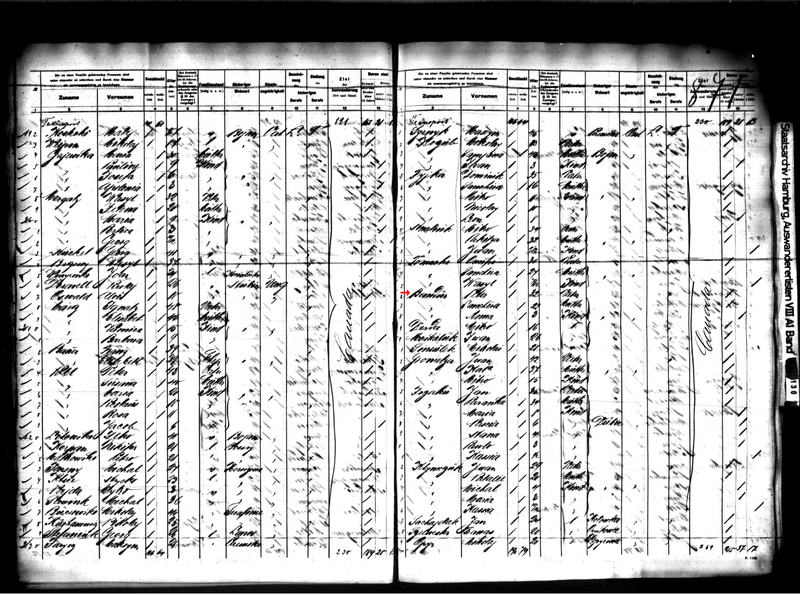 In 1902 they came to Canada by ship Bulgaria from Hamburg trhough Baltimore, USA and settled about 2Vz miles south of Boian Marea School. Ten children were born of this marriage. Annie, the oldest, married Thomas David. 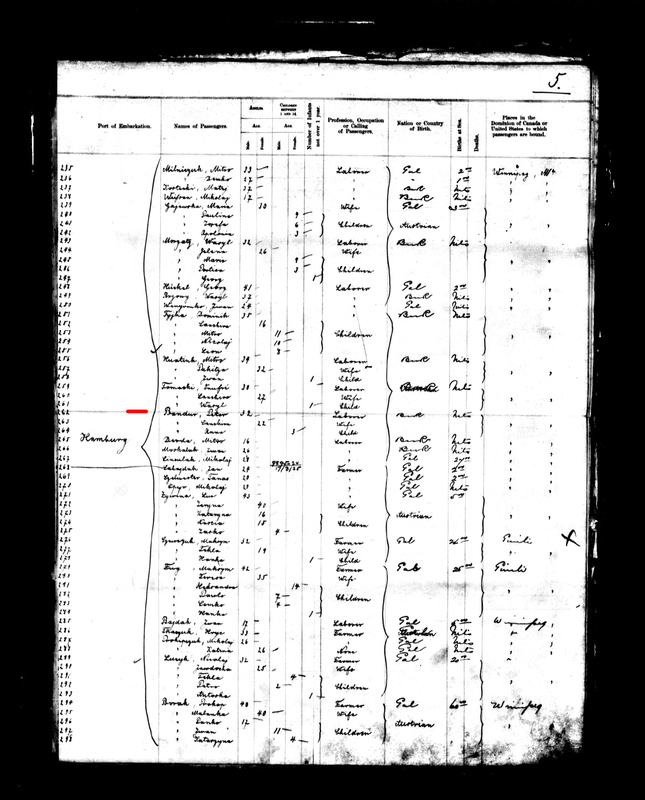 They settled at Gold Creek in the Hamlin area, and raised a family of three boys and four girls; Pete, Nick, Eugene, Mary, Sadie, Pearl and Helen. The second daughter Maria died during the flu epi¬demic. Vasilca married Nick Musurichan and they had one daughter Katie. 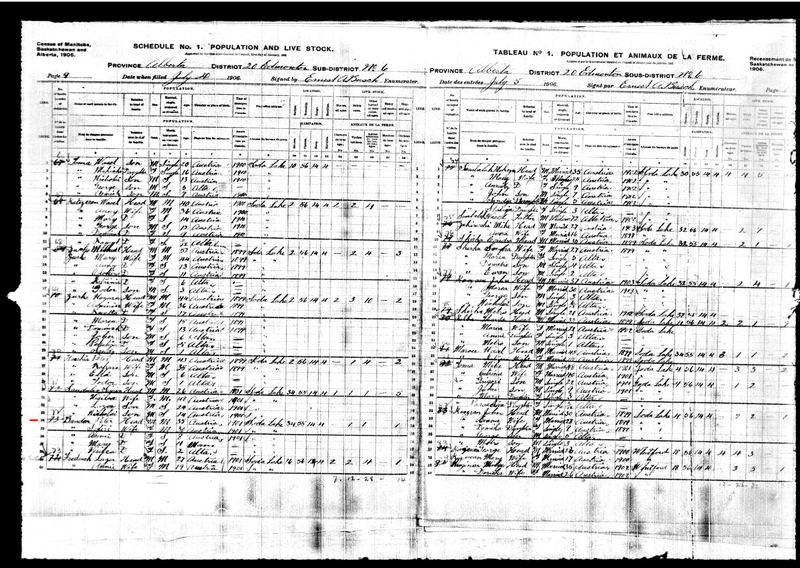 Nicholas married Mary P. Hauca. They have 2 boys and 3 girls. Peter died at a young age. Surviving are Shirley, Susie, Diane and Johnny. Jenny married Elie Hutzcal. They had two chil¬dren, Johnny and Margaret. Pearl (Pachija) married Pete Serbu. They had a son Peter and two girls Pat and Marion. Vera married Paul Musurichan. They farmed for many years at Suceava about four miles south of Andrew. They raised a family of seven children, Mary, Eugene, Lawrence, Charlie, Stanley, Delores and Leonard. 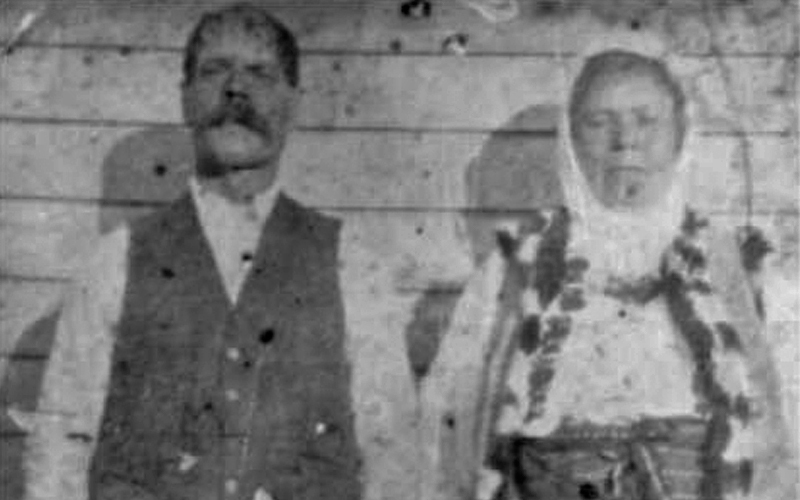 Dora (Domnica) married Nick P. Hauca. They farmed for many years, then moved to Edmonton. They had a son Lawrence and two daughters Louise and Doreen. Kay (Katrina) married Paul Stewart. They had a son Donald and a daughter, Esther. The baby of the family Stanley (Stephen) married Mary and are residing in Radisson, Saskatchewan. They have five children, Bernard, Charlotte, Mitchell and twins Tammy and Tracy. Sanfira Bandur was known to many as an excellent cook and showed her culinary skills at many weddings in the Boian area. In addition, she was a midwife and delivered many children in the district. From her mother she had acquired some medical skills and treated with some success people who suffered from chills, fevers and stomach aches. The Bandurs hauled mail to the country post offices. They would pick up the mail at MacGowan’s post office, near present day Hairy Hill and with their ‘democrat’ haul it to Boian, Shalka, Ispas and Kale- land, then back to McGowan’s. Besides farming, Petre did carpentering. He passed away of cancer in 1928. Sanfira, left a widow, managed to keep the farm going and brought up the family herself. She passed away in 1952 of diabetes. Records for this family has not been found yet. Please visit this page later.